"The greatest societies in history have had exceptional aspirations"
Since its conception, The West of England Initiative has recognised the need for a long term plan for the Bristol City region. In 2011, The Initiative published 2050: High in Hope – A Business Vision for the West of England City-Region. Inspired by the influential 1909 Plan of Chicago, which provided the city with a direction of development, 2050: High in Hope is a visual and written interpretation of a business vision for the West of England city-region. It is a strategic master plan for the region and a blueprint of the measures and goals that Bristol could make in order for it to realise its full potential as a leading European economic and cultural city. 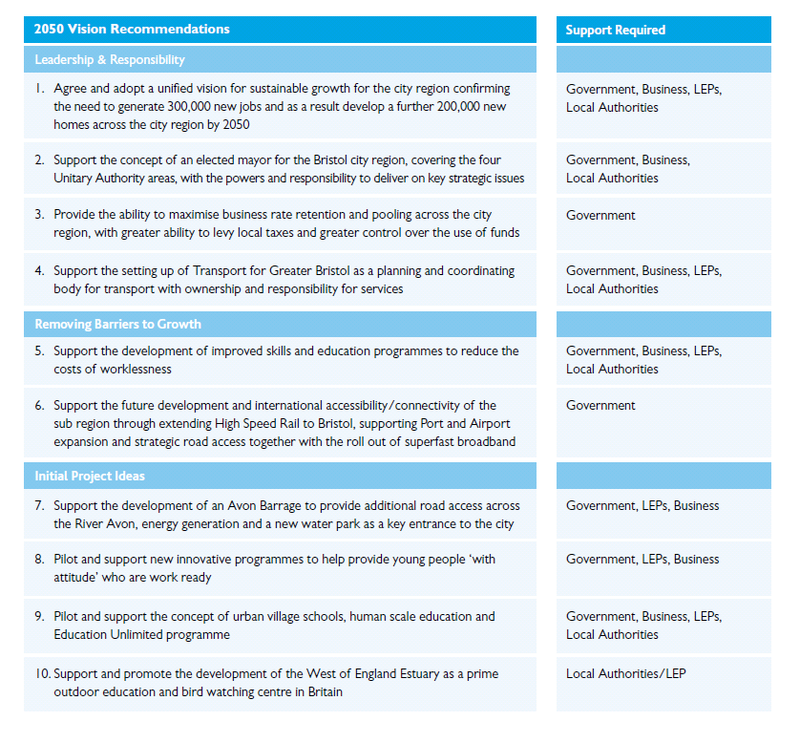 The 2050 vision is The Initiative’s framework and sets out our beliefs, values and goals for the region. However, the proposals and ideas put forward are not absolute. We welcome the continuation of debate, the collection of evidence and the development of concepts into achievable realities in order to develop the vision further, so the West of England can continue to expand and prosper. 2050: High in Hope is of vital importance to the West of England city region. Over the next 40 years, the Bristol sub region will bear witness to rapid population growth. Between here and 2050, the sub region will need to accommodate an additional 500,000 people, requiring 300,000 new jobs and a further 200,000 new homes. Without a vision and thoughtful strategic planning, the unavoidable growth will be haphazard, unproductive and possibly, corrosive. Combine this imminent rapid growth and the fact the regional spatial strategy has been scrapped and national planning policy lacks either a city-regional or visionary element, a clear sense of direction for development is needed now more than ever. The Vision fills the void in strategic planning and addresses the inevitable growth of the sub region in a calculated and considered manner. For the 2050 vision to be a success there needs to be an ongoing debate about many of the issues contained within and a continual refresh of new ideas and opportunities. Success will also need to be measured against achievements in terms of local and central government commitment to supporting change and helping to deliver on key recommendations. The schedule below outlines 10 key recommendations and actions highlighted as critical to the future growth and prosperity of the city-region. Alongside each issue is a clear indication of who needs to support and agree the proposed action. The 2050 vision emerged through a succession of discussion forums, workshops and briefing sessions. Starting in October 2009 these sessions informed people about what is happening in comparable city-regions in other parts of the UK and Europe. They also facilitated discussion of the specific qualities and needs of the West of England and started the process of bringing together a coherent strategy for managing growth. Participants in the creation of the Vision included Initiative members, architects, urban designers, town planners, academics, property developers and transport experts. Local residents, young people and local authorities also had a role to play in its creation, all of whom regularly attended strategy meetings to fine tune proposals. 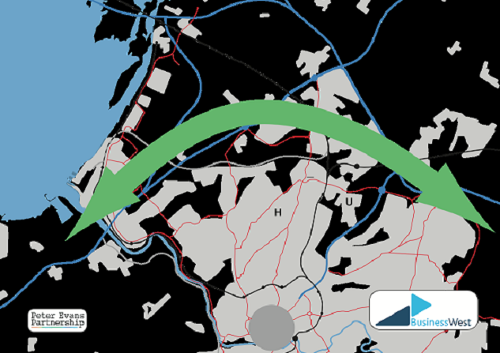 The 2050 vision goes beyond existing and planned strategies and documents; it reflects and borrows the best bits of all those plans but takes them a step further into a longer timeframe, where the emphasis will be on sustainable growth and the continued development of the city region as a successful economic unit. The Enterprise Arc marks the areas of high growth across North Bristol, stretching from Avonmouth in the West to Emersons Green to the East.The Enterprise Arc area of North Bristol will witness a significant increase in houses and jobs in the future, with three major applications currently in progress to develop the Cribbs Patchway, New Neighbourhood and Filton Enterprise Area. The growth in this area is crucial to the rest of the city and The Initiative is working to stress the importance of this area ensuring that adequate infrastructure is provided to facilitate this growth and link the development areas across the North to the wider city of Bristol. 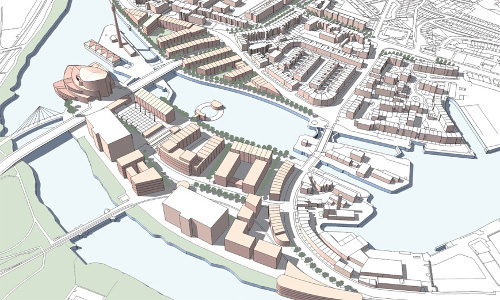 One of the major projects in our 2050 Vision is the development of the Cumberland Basin. The current cost of maintaining the existing high-level bridge and its associated approach roads is excessive. As a result, we believe that the bridge should be replaced with a new low level crossing and to transform the surrounding land for new houses and offices to create an impressive gateway into the city. 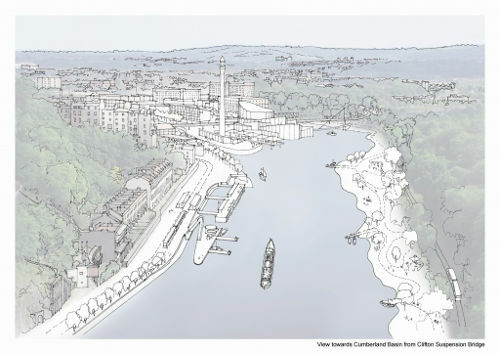 The Initiative is also working on building a barrage across the Avon in order to protect Central Bristol from anticipated major flooding and to turn the water into a major environmental, cultural and economic asset for the region.